Once you select your favorite Karastan rug, its important to protect your investment with a quality pad. Our Down Under pad is designed to keep your Karastan smoothly in place while extending its beauty and life. 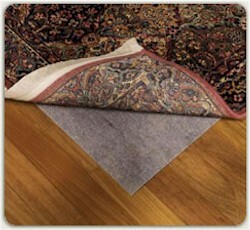 We build three layers of protection and comfort into every Down Under rug pad. A Thermo-Bonded surface and waffled latex backing offers superior slip resistance while a center of synthetic fibers provides comfort and sound absorption. Together, these layers create the ultimate foundation for your Karastan rug.